Fink’s Garage was one place to fill’er up during the 1930’s. 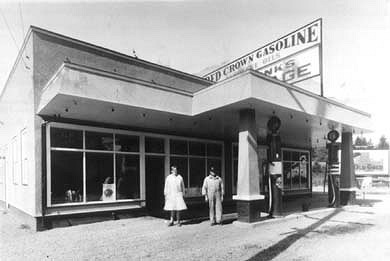 The station sold Red Crown Gasoline, which is now known as Chevron. The garage later became the Fink Motor Company, with the proprietor selling Chevrolet cars and pick-up trucks. The dealership eventually was sold to the Stonebridge family, which continued selling Chevrolets for many years, including post-World War II years. If the building seems a bit familiar, it could be because it is well known today as the home of Busch Collision, 290 East Sunset Way.